Ivan I Daniilovich Kalita, aka, Ivan Moneybags is my selection as the 5th best Russian ruler of all time. 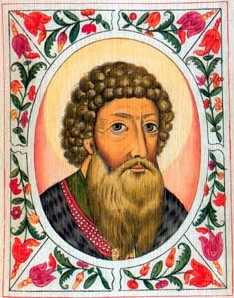 His leadership initially as the Grand Prince of Moscow then Vladimir, was critical in the growth of Moscow during the time of the Golden Horde. Ivan I also was known as the “gatherer of Russian lands” as he greatly increased the area of control and the wealth for future Grand Princes of Moscow. Born in 1288 to Grand Prince Daniel of Moscow making him the grandson of Alexander Nevsky, Ivan I was a very shrewd man who would bring great wealth to his people. His rule was a time when the Golden Horde had reached its zenith. Its control over Russia was complete. Anyone wishing to be a Grand Prince had to go to the Horde’s capital in Sarai to ask permission. Many were killed there due to court intrigues. Ivan knew how to manipulate the system though and survived and thrived under the Horde’s rule. As Grand Prince, Ivan was given the job of collecting taxes or tribute for the Horde. He was masterful at it and this brought him great favor with the khan at the time, Muhammad Ozbeg. Many have speculated on why Moscow rose so quickly under his rule such as its central location, but I feel his wise rule set the stage. Many of the other princes of Russia despised him but they could do little. If they tried to attack Moscow, they would face the wrath of the Horde. Over the years, Ivan loaned many of his fellow princes money which they eventually proved unable to repay. In those cases, the Grand Prince of Moscow would take their land and incorporate it into his realm. Another trick he used was to invite as many people to come to Moscow as he could. Because the Mongols continued to raid the Russian steppes, many came to get away from them. Due to his good relations he had with the khan in Sarai, he was able to set up his son as not only his successor in Moscow but in Vladimir as well. This continued over the years which brought much stability to Russia until the Time of Troubles in the early 1600’s.